The Law Foundation of Ontario created the Guthrie Award in 1996 to honour H. Donald Guthrie who served as a Foundation trustee for 21 years, including 13 years as Chair. 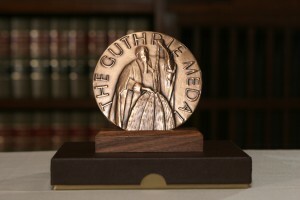 The Guthrie Award recognizes outstanding individuals for their contributions to access to justice. The 2019 Guthrie Award will once again recognize an access to justice champion. Past recipients have come from many directions – the judiciary, private bar, community legal clinics, and nonprofit organizations. They saw a chance to make a difference and took it. Guthrie Award recipients have: built bridges between youth and the justice system; advanced justice for Indigenous people; served women experiencing violence; and strengthened the community clinic system to assist people with low-incomes; and more. With the 2019 Guthrie Award, the Foundation hopes to recognize a champion who is actively engaged with the challenges and opportunities in today’s justice landscape – someone who has made a difference in the past and is also focused on the future. The celebratory event to honour this year’s recipient will provide an opportunity to profile both the important work that has been done to advance justice for all Ontarians. The Foundation welcomes and encourages nominations of individuals who have a significant and proven track record of furthering access to justice. A Guthrie Award recipient joins the legacy of the Guthrie Award and becomes a member of an esteemed group recognized for their achievements in improving access to justice. As part of the award, the recipient is presented with an engraved medal and the Foundation organizes a reception in the recipient’s honour. The reception is attended by guests of the recipient, as well as by trustees of The Law Foundation of Ontario and notable members of the bar and the justice sector. In previous years, the reception has been held at the Law Society of Ontario. Additionally, the Foundation announces the award recipient in media outlets, including print and social media. For more information, please contact Tanya Lee, Chief Executive Officer, at 416-598-1570 or tlee@lawfoundation.on.ca.